Between them, they'd pretty much defined pop music since the '60s, paving the way for countless other acts and recording numerous songs that would go down in history as classics. So, it was a pretty big deal for Paul McCartney and Michael Jackson to collaborate musically. This week in 1983, the second single from the superstar pair was as well received as the first one had been a year earlier. The bonus: this time, the song on which they duetted was actually really good instead of just OK.
Another really good song held down the number 1 spot on the ARIA singles chart this week in 1983. "Karma Chameleon" by Culture Club spent its second week on top. Sheena's transition to working in America paid dividends, with this boppy lead single from fourth album Best Kept Secret hitting the top 10 of the Billboard Hot 100. In Australia, not so much. I don't quite know what to make of this song from the Perth band with the unusual name. The verses sound like any number of synthpop tracks before it explodes into a Status Quo-style chorus. Odd. Number 79 "Club Tropicana" by Wham! Until final single "Where Did Your Heart Go? ", this was the only blight on Wham! 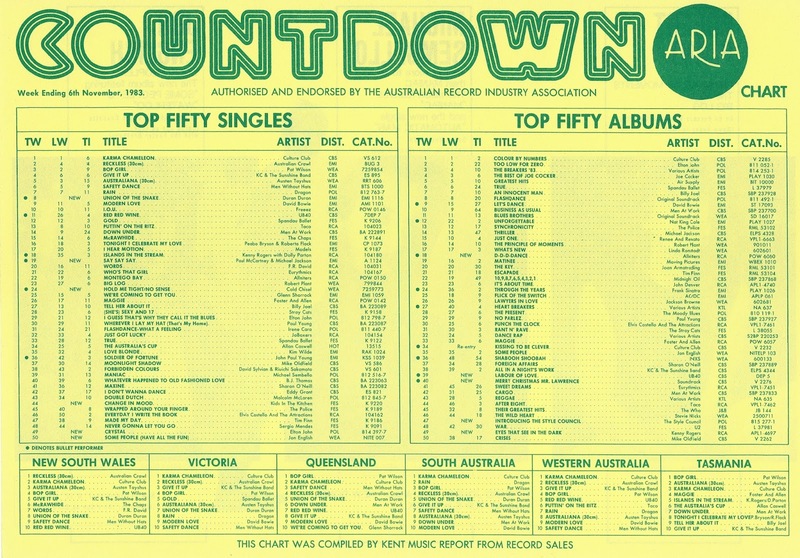 's run of top 10 singles in Australia. I never liked "Club Tropicana" as much as their other songs, but I'm surprised it flopped so hard. My memory of Jon English the musician is limited to that song from the colonial miniseries - and fair enough, since "Six Ribbons" was his biggest single. But, the husky voiced singer had a number of other hits between 1973 and 1980, including "Words Are Not Enough" (number 6 in 1978) and "Hot Town" (number 11 in 1980). It'd been three years, however, since Jon had been inside the top 50 and he only barely managed it with the (sort of) title track of latest album Some People..., which climbed to number 50 in its 12th week on the top 100. 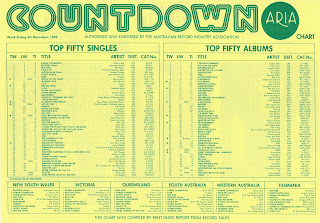 Given its catchy chorus and the fact it sounds like the kind of song Rod Stewart would've sung at the time, "Some People (Have All The Fun)" should probably have done better, but it would end up being a rather understated final top 50 appearance for the Logie, Mo, Countdown and ARIA Award winner, who passed away earlier this year. Here's a '70s star who'd had no trouble keeping his momentum going in the '80s, so much so that this latest hit from Too Low For Zero almost made the top 10 without even having a music video. Only released as a single in its own right in Australia, "Crystal" was given double A-side status in the UK alongside A-side "Cold As Christmas (In The Middle Of The Year)". But, given "Cold As Christmas..." wouldn't make much sense in Australia, especially coming into the festive season, and "Crystal" is actually a much better song, Elton's local record company opted to go with the latter (and a different B-side) instead. Already in 1983, Real Life and Machinations had proved that Australian synthpop bands could be every bit as good as ones from the UK. As the year drew to a close, two more groups that were heavily influenced by British new wave and New Romantic acts made their presence felt on the ARIA chart - and would continue to do so for the next few years. The first was Melbourne's Kids In The Kitchen with their Simple Minds-ish debut single, "Change In Mood", which surprised the band themselves by making it all the way to the top 10. The other? We'll see them in December. As successful as homegrown electronic music was becoming, it wasn't about to overthrown pub rock as the dominant genre in Australia just yet. And to prove the point, one of the biggest rock bands in the country charged back into the ARIA top 50 for the first time time in over a year this week in 1983. Last seen on the top 50 with "When The War Is Over", Cold Chisel returned with a double A-side release that would end up on their next (and final, for the time being) studio album, Twentieth Century, in April 1984. Although theoretically the lead track, the short and to the point "Hold Me Tight" was actually the less popular of the two songs, with the ska-influenced "No Sense" receiving more airplay and being included on later compilations Radio Songs and Chisel. They'd already released one duet - Thriller lead single "The Girl Is Mine" - but this collaboration between two of music's most legendary performers had actually been recorded earlier and held back until Paul's Pipes Of Peace album. 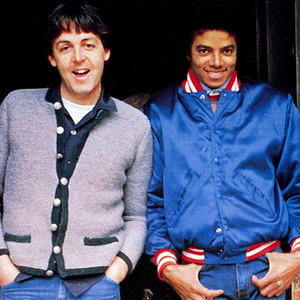 "Say Say Say" was the first release from that album, just as "Ebony And Ivory", Paul's duet with Stevie Wonder which reached number 2 in 1982, had been the lead single from Tug Of War. Michael, meanwhile, was still in the midst of releasing singles from Thriller with three more still to come in Australia. After the disappointing performance of "Wanna Be Startin' Something", "Say Say Say" put him back in the ARIA top 5. In the US, only "Thriller" remained to be lifted as a single and "Say Say Say" followed the album's six top 10 hits to date. By reaching number 1 in the US, the duet became Michael's seventh top 10 hit of 1983 - breaking the record held by... The Beatles (together with Elvis Presley). Unlike "The Girl Is Mine", which had also reached number 4 in Australia, "Say Say Say" came with a music video, in which Paul and Michael played travelling conmen aided by Paul's wife, Linda. Oddly, LaToya Jackson also appears in the clip - as a love interest for Michael's character. Macca and Jacko might've been music superstars, but even they couldn't compete with a brand new song from one of the hottest bands in the world for the honour of the week's highest new entry. Only the third release to shoot straight into the top 10 in 1983 - their own "Is There Something I Should Know?" had been the first and Australian Crawl's Semantics the second - "Union Of The Snake" was snapped up by Duranies eager for new music from the British five-piece. Unlike "Is There Something...", "Union Of The Snake" would be included on Duran Duran's forthcoming third studio album, Seven And The Ragged Tiger, which had been completed in Sydney and had its cover photo taken outside the State Library of NSW. The video for the single was also filmed locally, with the band's regular presence down under no doubt partially responsible for the fervour which greeted most of their new releases in the mid-'80s. Next week: Billy Joel's latest retro-inspired single becomes his first number 1, while a chart-topping novelty single from New Zealand tries its luck in Australia. Plus, a punk legend reaches the top 50 with his latest band. 'Telefone', which I hadn't heard before, is a bit (Laura Branigan) 'Gloria'-esque. 'Dirty Weekend' brings to mind the Molly Meldrum interview with Rod Stewart, where Molly asks if he's ever had a dirty weekend (it was the name of a track on his album). 'Club Tropicana' seems better-remembered than its local #60 peak would suggest. rage aired the Jon English clip as part of their tribute to him earlier this year (it's funny how he warranted an hour or more tribute, while Pete Burns got a meagre 5 songs). The chorus seemed vaguely familiar, so maybe I heard it in '83. Radio loved Elton back then, and so I knew 'Crystal', despite not knowing it by name. I like how 'Change In Mood' builds up gradually. You don't get many charting songs like that now; or at least the few that I've heard. Scott looks very young in that interview. 'Union of the Snake', which I wasn't really familiar with, doesn't really stand out as a Duran Duran classic. Crystal by Elton John was very 80s - all synths instead of piano. That album of his from 1983: Too Low For Zero has about 50-50 ratio of piano to synth, but its long and successful chart run was driven by all his hit singles - they released 5 Top 40 hits off it in Australia. My Grade 8 school friend had it on cassette which was my first time listening to an Elton album, I recall, though by then of course I couldn't help but to have absorbed many of his past classics (Goodbye Yellow Brick Road, Song For Guy, Your Song, Crocodile Rock and Little Jeannie spring to mind) from the radio. My brother liked Duran Duran, and I remember buying him Seven And The Ragged Tiger for his birthday the next year in May. I was never a fan of Union Of The Snake though - it is still pretty much gibberish! Club Tropicana was the okay fourth and final single from the Wham! album Fantastic, but I remained completely unaware of them until July/August 1984 when they hit #1 with Wake Me Up Before You Go Go.